Darius Arya, an archaeologist living and working in Rome, digs underneath the city's Christmas traditions. 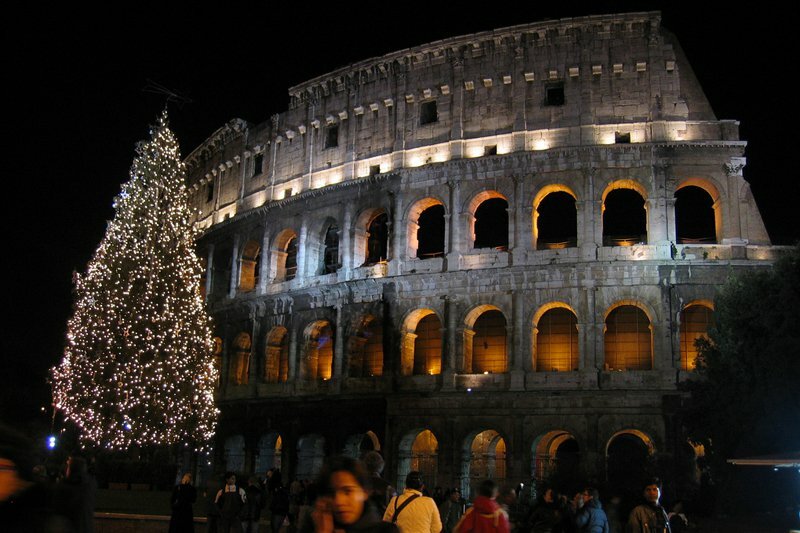 ROME – 'Twas the night before Christmas and all through the house, not a creature was stirring, not even a mouse. Definitely not in the . Known today as a pilgrimage site (housing Peter and Paul, according to medieval tradition), Mamertinum (or Tullianum) is empty except for the sound of the water trickling from the natural spring. I like to enjoy the somber, submerged environment beside the Roman Forum, imagining the fate of some of its most famous ancient enemies of Rome: Lugurtha, Vercingetorix, Perseus of Macedon, and Catiline. Mom in her kerchief and I in my Gallo cap were sipping some Franciacorta while the kids slept, not just with visions of sugar plums dancing in their heads. Their bellies were full after an evening stroll to Piazza Navona. Rome's most famous Christmas market is a dream come true for children — cotton candy, games, toys, and a 200-year-old merry-go-round. But Navona is also the site of the famous (90s AD), one of Rome's famous game venues for viewing mostly Greek athletic competitions. Excavations on the northern side revealed the substructures (and ancient ground level) 25 feet below. We heard a clatter outside — I opened my double-glass windows — but it was just a party of revelers in Campo de' Fiori, where I live. If you are in search of St. Nick in Rome during Christmas, then seek no further than , next to the in the southernmost portion of the Campus Martius floodplain. What's amazing is that it sits on top of the remains of three Roman Republican temples, all in a row, dedicated to Spes, Juno, and Janus (who ushers in the new year on January 1st). You can crawl beneath St. Nick's to see the temple remains. Sites and sounds are festive all through the city, from Pantheonand Piazza di Spagna to Via del Corso with its impressive stream of lights. But there's nothing like strolling around Largo Argentina, the Republican temples and site where Julius Caesar was killed (it's now a ), and admiring the imposing Augustan-era in the Testaccio quarter. As you would imagine, Christmas trees in Rome abound, too. Especially the one at St. Peter's Square, which stands next to Caligula's imposing Egyptian obelisk, and that of Piazza Venezia, but nothing warms my heart more than the tree next to the Colosseum, the symbol of pagan Rome. To uncover more of ancient Rome, check out the . Contribute to Darius Arya's , and you'll soon be able to watch a new online film series about archaeological digs around Italy. 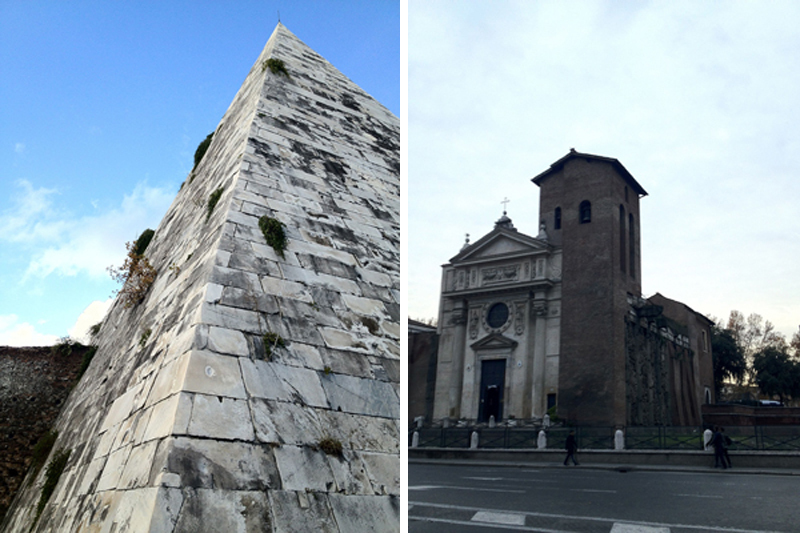 Photos: Darius snaps pictures of Piazza Navona, the pyramid tomb, and S. Nicola. Family portrait in a Christmas ornament by Erica Firpo. Darius is an archaeologist who lives in the heart of (ancient) Rome. He travels to explore, dig out, and preserve the ancient in contemporary societies.